KordaMentha has been a major corporate partner of the Chain Reaction Challenge Foundation from the beginning. So far, in excess of $27 million has been raised for more than 60 charities. Outside of our day jobs, KordaMentha staff are actively engaged in giving back to their communities through a range of sports and charity commitments. Chief among these is the Chain Reaction Challenge Foundation, which was founded in 2007 by KordaMentha Real Estate managing partner, Berrick Wilson, to raise money for sick children’s charities. KordaMentha houses Chain Reaction within our Melbourne office and provides accommodation, technology and administration support. Chain Reaction is not a mass-participation event. Instead it is designed for executives chasing the physical challenge and personal pride that comes from riding a 1000-plus kilometre course in seven days. The challenge consists of a series of gruelling cycling events that are held across the east coast of Australia each year, and riders must be physically and mentally fit, work well in a team and possess strong networks in order to qualify. Riders are expected to use these networks within the business community to raise a pre-determined minimum amount in personal donations. In return, riders benefit from valuable networking opportunities and the immense satisfaction of directly helping sick children through charities such as the Starlight Children’s Foundation, Monash Children’s Hospital and Brisbane Royal Children’s Hospital Foundation and the Victor Chang Cardiac Research Institute. When Berrick’s daughter, Milla, was only two days old, she was rushed to hospital with a sudden brain haemorrhage and spent a number of weeks at the Newborn Intensive Care Unit at the Monash Medical Centre. Milla went on to make a full recovery, but during those fretful nights at the Intensive Care Unit, Berrick vowed to turn one of the worst experiences of his family’s life into something positive. “I knew that Milla survived due to the dedication of medical staff and the quality of care she received,” Berrick said. More than a decade after Berrick began the Chain Reaction challenge, it has bloomed into one of the most successful corporate charity rides in Australia. Our team plays a vital role in the Chain Reaction challenge, with KordaMentha staff from across the nation committing their time to the various Chain Reaction cycling races held each year. It’s not just riders who learn and grow through the challenge, either. A cadre of support crew also benefit from the spirit of camaraderie and teamwork that is the hallmark of a Chain Reaction cycling event. While helping to raise money for sick children’s charities will always be the main focus of Chain Reaction, KordaMentha staff also benefit from the satisfaction that comes from testing their limits and, most importantly, pulling together as a team. 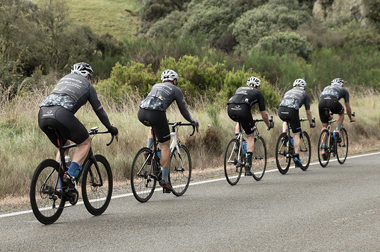 The 2019 Chain Reaction Victoria Challenge saw riders travel south from Sydney to Melbourne, covering more than 1000 kilometres over 7 days. The 13th Victorian ride was a special one bringing together 43 riders and raising more than $1 million for Starlight Children’s Foundation and Very Special Kids, bringing the total funds raised for children's charities to over $27 million since 2007. 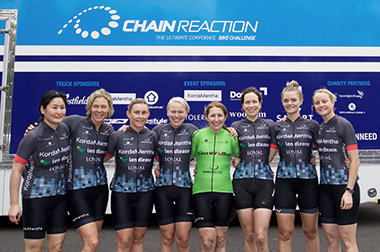 The 2019 Chain Reaction Queensland Challenge saw riders travel south from Canberra to Melbourne over 7 days. KordaMentha Partners Jarrod Villani and Brad Bennett joined the peloton of over 50 riders raising more than $1 million for the AEIOU Foundation and Ronald McDonald House Charities South East Queensland.